Macao is just 20 minutes from the Hard Rock Hotel in Punta Cana and the taxi stand outside posts that the ride will cost $30. For about $150, you may purchase a surf package at most Punta Cana hotels. They will drive you by shuttle bus to Macao, where for 45 minutes you will learn the basics of surfing. 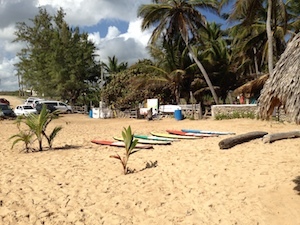 Class takes place on a small local beach next to some concrete “huts” where a variety of activities occur, including cooking and selling surf lessons. After a short break, you will head back out into the ocean with your guide to help you ride the gentle waves on Macao for another 45 minutes. Once you feel comfortable, you may rent a board for as little as $25 a day. Your guide will position you properly in the surf (which is key to catching a wave) and give you a helpful shove when the wave begins to take you for a ride. Your time standing on the board will be short, about 10 to 15 seconds. The waves here are generally safe and peaceful due to the slightly-angled sandy bottom, and they are rideable all the way to the shoreline. Surfing is hungry work and thankfully, there are locals BBQing chicken, beef, and pork right on the beach. Cold drinks and freshwater showers are also available. Macao is not a groomed resort beach. It is a local public beach so there may be a little trash here and there. But this is the Caribbean. It’s not Disneyland. The place itself and the people who live there are the real beauty. Don’t get hung up on a plastic cup dropped by someone who does not appreciate the natural beauty of Macao. Do that and you will have a tough time in any Caribbean country. Instead, look right through the crystal waves as they crest. Feel the grainy yellow sand stick to your toes. Laugh along with the giggling group of tourists riding their horses, splashing along the shoreline, completely caught up in this childish moment. 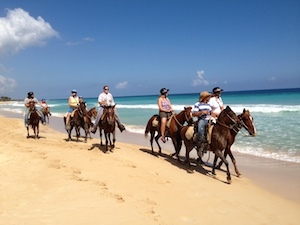 If there is anything that can make you forget your iPhone quicker than riding a horse on a Caribbean beach, please let me know. 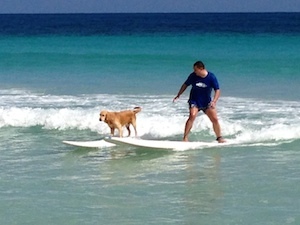 If you are lucky, Jack the Dog will emerge and surf a wave or two for you. Jack is the mascot at Macao Surf Club. The owners there are very proud of Jack and they will tell you of his exploits as they pick the right board for you. They might have a t-shirt or sticker for sale to remind you of the place, or they might not. When I was there, they were fresh out of both. They might have change for your 1,000 peso note for the beer you bought, and they might not. Use the change for a great tip, or just get another beer. Remember, this is surfing in the Caribbean, not cashing a check at Bank of America. Waves are the end result of the tides, the shape of the ocean floor, and the wind blowing across the surface. Depending on who you are, you may choose to approach the ocean in a scientific manner or attack the sea like an athlete — or you may be more philosophical about surfing. All of that will be determined later. Your first day should be all about fun. Surfing is the only sport where nature actually reaches up and takes you for a ride. Give it a try and you will learn a lot about the ocean and yourself without much effort.